When you’re in your late 20s, it goes without saying that there is a need to buck up in the anti-aging game. However, it’s actually proven positive that your skin can improve with age with the right protection for your skin to repair itself. Even when we think we are protecting our skin from sun damage with sunscreens containing UVA and UVB protection, UVA and UVB only make up 7% of the light spectrum while visible light and infrared comprise of the remaining 93%, and can induce 50% of the free radicals that contribute to skin damage and premature ageing. 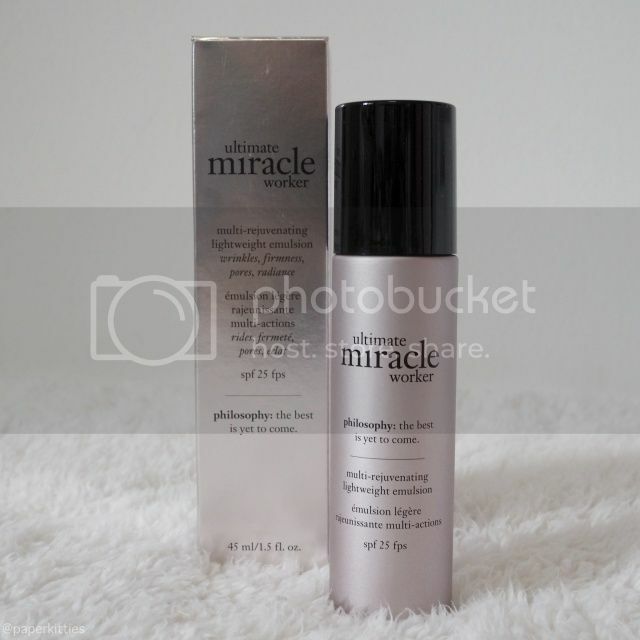 With philosophy ultimate miracle worker range, it aims to create miracle every day and night with its multi-protection and multi-rejuvenation properties. This entire range also contains philosophy patented high performance bi-retinoid plus and iris plant extract to reinforce and rejuvenate the skin. When it comes to ageing, other than your neck, your eyes is next in line in showing the first sign of ageing. With the newest philosophy ultimate miracle worker eye (15ml for SGD$90), this anti-aging eye innovation not only offers complete protection but also aims to multi-rejuvenate your eyes by targeting on lines, wrinkles, loss of firmness, dark circles and puffiness. 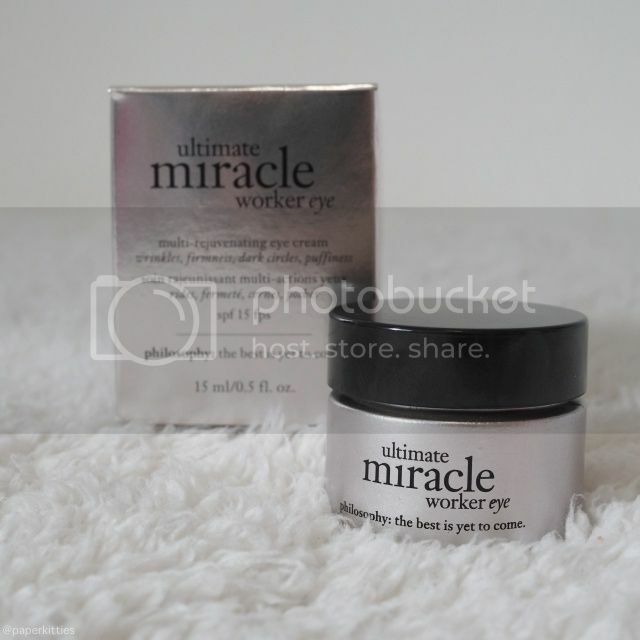 I was quite skeptical with this philosophy ultimate miracle worker eye initially as I do not have good experience with eye creams, what more with its opaque and seemingly thick texture. But my worries were for naught when I realise how lightweight it is and how it absorbs into my skin with a slightly matte afterfeel. I’m impressed. Though it is too early to see the benefits when it comes to my severe dark eye circles, I’ll give bonus points for this multi-rejuvenating eye cream broad spectrum SPF15 properties to protect your skin from daily aggressors such as the sun so as to prevent premature ageing. The philosophy ultimate miracle worker day emulsion (45ml for SGD$100) is so lightweight and fast-absorbing, you’ll be surprised that it’s even a moisturiser! This all-in-one anti-aging skincare targets wrinkles and pores whilst promoting radiance and firmness. With its multi-protection patented technology (that is actually formulated for the entire range) protects skin from the damage caused by infrared and visible light while the sun filters shield the skin from harmful UVA and UVB rays. I have no complaints about this emulsion, its texture is exactly as promised and is very suitable for our humid weather here – especially if you have combination to oily skin. When fully absorbed, there’s not the slightest bit of greasiness but it has a creamy texture to protect and keep your skin hydrated throughout the day. 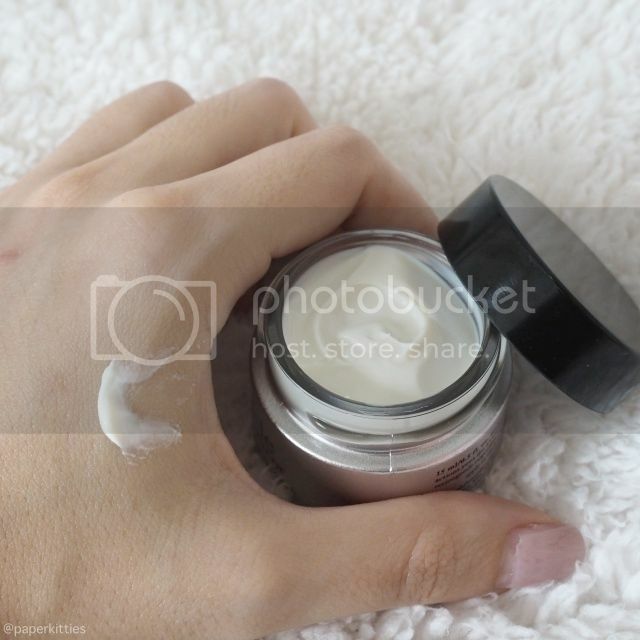 But if you have dry skin, spend a lot of time in an air conditioned area, or are traveling to a dry climate, the philosophy ultimate miracle worker multi-rejuvenating day cream broad spectrum spf 25 (60ml for SGD100) is something you should have, to provide your skin with the necessary hydration it needs. Like the emulsion, this multi-rejuvenating day cream is the ideal way to achieve your best skin in years: more firm, dense and radiant, with less visible wrinkles and pores. I actually made a silly mistake once where I used BOTH the emulsion AND the day cream at a go, thinking that the emulsion was more of a serum instead of a moisturiser. Well, this is what happen when you don’t read before you try products -.- Regardless, I was out the entire day with my usual makeup and it was as if everything was as per normal! No excessive oiliness that occurs when I use products that are too rich, nor bumps that occur as a result of it. It speaks so much of the hydrating properties and how suitable it is for our humid weather, even when you have oily skin! With the kind of unforgiving sun that we put up helplessly with for months, it does bring me some comfort that at least I have a skincare that can protect my skin from premature ageing. But what I actually find the most interesting out of the entire range is ultimate miracle worker night, multi-rejuvenating nighttime serum-in-cream (60ml for SGD$120)! As all you skincare junkies should know by now, your skin is the most active at night, holding the optimal conditions for our skin to rejuvenate, revitalize and repair day-to-day damage caused by our environments, lifestyles and overall health conditions. With this all-in-one nighttime anti-aging miracle from philosophy, it combines the concentrated power of a serum with the nourishing benefits of a cream to help dramatically reduce the signs of present and past skin-aging, while you sleep. Remember the multi-protection and multi-rejuvenation properties I was talking about earlier? Together, they help your skin rebuild its natural collagen and rejuvenate its appearance layer by layer. It comes with a fresh mix-in pearl delivery that I find as such an interesting concept! It’s called the fresh-pour system. This is actually the serum part that contains the active iris plant cells. The ultimate miracle worker nighttime serum-in- cream will only be fully activated upon mixing in the pearls, so you’ll get to enjoy maximum skin performance at first use. 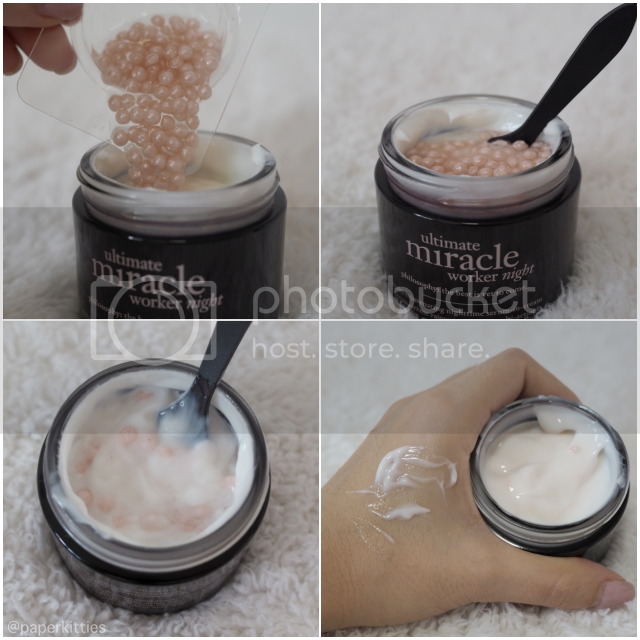 Now here’s the fun part~ Pour the pearl serum into the night cream and wait for 5 minutes, before stirring it in and apply on your skin. 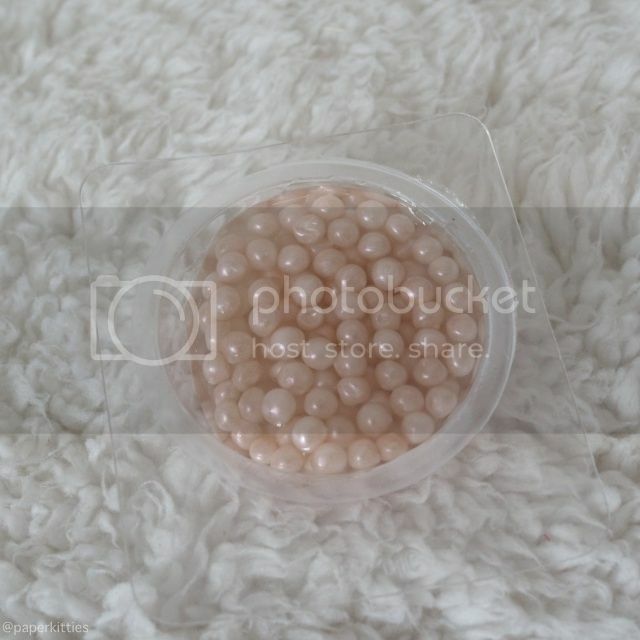 The cream is white in colour before you mix in the pearls, and when they’re all mixed together, the colour of the cream will change to a slight pinkish shade. That’s when you know it’s ready to be used! In fact, this night cream is so potent, it contains 2x more concentrated dose of active iris plant cells than the day cream/emulsion. Therefore, the texture was unsurprising much richer and takes a longer while to absorb. When fully absorbed, my skin feels sticky but not greasy (something I can live with since I sleep with a/c every night) and I wake up with smooth, soft skin without turning into a greaseball.